December 5, 2018 1:41 pm. Danon Fantasy is one of the main contenders this weekend. Source: Japan Racing Association. This coming Sunday and next, the JRA turns the spotlight onto the budding talent – this year’s 2-year-olds. It’s ladies first with the Grade 1 Hanshin Juvenile Fillies on Dec. 9, followed by the Asahi Hai Futurity Stakes the week after. This year, the 70th running of the showcase for 2-year-old fillies sees 23 youngsters nominated. With careers still young, many of those taking on their first top-level race have only a few races behind them, some only one prior start. Fifteen fillies have earned a spot in the final lineup of 18 already and only three from the remaining eight will win berths in the final lineup. 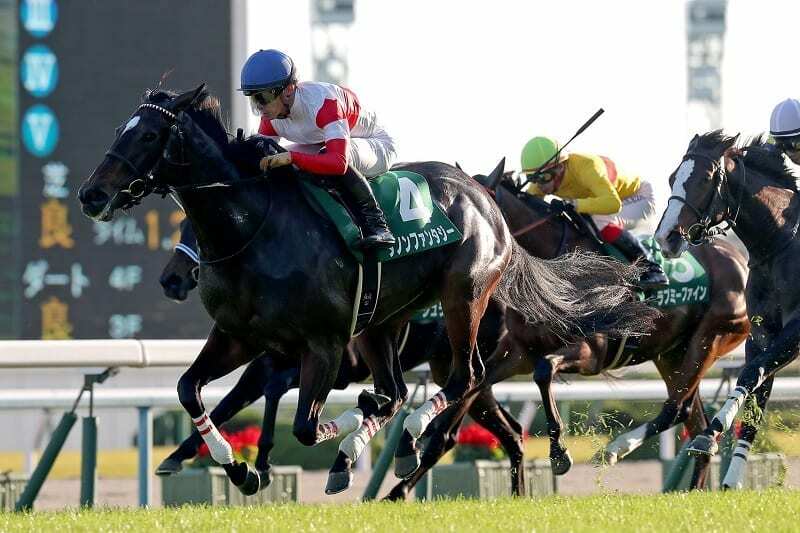 All will carry 54kg over the 1,600 meters of the outer turf course of the Hanshin venue west of Osaka. The winner will earn JPY65 million and be virtually assured of the title of Best 2-Year-Old Filly for the 2018 JRA Awards. The 1,600-meter outer course at Hanshin, where races are run to the right, is also the course used for the Grade 1 Oka Sho (Japanese 1000 Guineas), the first race in the fillies triple crown. The race starts in the backstretch and covers 444 meters before the first turn. With 3 furlongs to the finish line, the track dips 2 meters over 400 meters, then rises steeply again over the last 200, making it a formidable test of stamina as well as speed. The race record is held by Vodka, who clocked 1 minute, 33.1 seconds in 2006. The Hanshin Juvenile Fillies will be Race 11 race on Hanshin’s Sunday card of 12, with post time of 15:40 local time. Danon Fantasy: This Ritto-based daughter of Deep Impact lost her debut, which pitted her against colts over 1,600 meters at Tokyo, but she scored her first victory at Hanshin three months later, topping the all-female field by 2 lengths. From there Danon Fantasy leapt to the graded level and, as the race favorite on Nov. 3, aced the Fantasy Stakes, a Grade 3 race for 2-year-year old fillies at Kyoto over 7 furlongs. Danon Fantasy, who was born early in January, has a headstart on most of the others. For the two races thus far in her autumn campaign, her weight was up nearly 20kg from her June debut and she looks to have packed on some muscle. Peace of World was the last to go from the Fantasy Stakes to the Juvenile Fillies winner’s circle, back in 2002. Cristian Demuro, who worked Danon Fantasy on the flat on Nov. 28, is expected to be paired with the filly for their first race. Chrono Genesis: A daughter of 2004 Prix de l’Arc de Triomphe champion Bago, Chrono Genesis has only two starts thus far, both over 1,800 meters and neither at Hanshin. She won them both, however, and both were tough races, both against colts and both following long trips to the track. In fact, in her previous start, the open-class Ivy Stakes at Tokyo on Oct. 20, she was the only filly in the field of ten 2-year-olds and topped them by 2 lengths. Racing from a good position, her final lap times were 11.3-11.0-11.1 – quite a heated finish. With her even temperament, Chrono Genesis should have no trouble over a furlong less and she has the stamina to handle the outer Hanshin course. In the Ivy Stakes, Ritto-based trainer Takashi Saito said, “She waited patiently and went all out in the final stages and displayed the kind of kick we thought she would from her morning work.” This will be her first time to be transported to the track on raceday and her first mile, but she will be closer to home. “The pace looks like it’ll be different, but I expect her to handle it well,” Saito said. The last two years have seen fillies with only two races behind them go on to win the Hanshin Juvenile Fillies. Soul Stirring won it in 2016 coming off the Ivy Stakes and Lucky Lilac last year after winning the Artemis Stakes. Yuichi Kitamura, who rode Chrono Genesis’s last two starts, is expected to have the ride Sunday. Schon Glanz: A striking black filly by Deep Impact, Schon Glanz is a sister to the Frankel-sired Soul Stirring, out of the Monsun mare Stacelita, and both are trained by Kazuo Fujisawa. Schon Glanz lost her debut over 1,800 meters, but scored two for two after that. Last out was the Oct. 27 Artemis Stakes, a Grade 3 race over 1,600 meters at Tokyo. Coming from far off the back after missing the break, Schon Glanz passed 12 horses on her way to topping the field of 2-year-old fillies by half a length. Her final 3-furlong time was 33.8 seconds and her total time a race record 1:33.7. Unlike her sister, who tends to advance gradually, Schon Glanz kicks into high gear and is gone, a running style well-suited to the Hanshin outer course. Her movement is good in work, though she has only been breezed, and is expected to show improvement from her last start. Yutaka Take, expected to have the ride on Sunday, will be flying back to Japan from an appearance in Hong Kong’s International Jockeys’ Championship at Happy Valley Wednesday night to participate in the Hanshin Juvenile Fillies. Take last won the Juvenile Fillies in 1994, but has won three 2-year-old Graded races this year. Beach Samba: A daughter of Kurofune, the Yasuo Tomomichi-trained Beach Samba was born relatively late in the year and only debuted this September. She won that race (also over the Hanshin outer 1,600) and went directly to the graded-stakes level, where she ran second to Schon Glanz in the Artemis Stakes in late October. Unlike the latter filly, Beach Samba had the long haul from Ritto to contend with and became agitated once in the gate. She too missed the break but traveled well and only missed the win by half a length. This time out she’ll have the home advantage and, if she keeps her cool once in the gate, she will definitely be a contender. She worked in a trio under Yuichi Fukunaga on the flat Nov. 29 for a fine 5-furlong time of 65.8 seconds. “It was a good, hard workout. She’s eating well and has kept the condition she had for her last race,” Tomomichi said. Two of Tomomichi’s three fillies nominated for the race – Beach Samba and Red Anemos – have only two starts behind them. Red Anemos: The Victoire Pisa-sired Red Anemos is two for two, and now making the leap to the racing heights from the Sept. 30 Saffron Sho, a one-win class race over a mile at Nakayama. She won wire to wire, exhibiting the speed she likely inherits from champion sprinter Sakura Bakushin O on her dam’s side. Despite the rise in the stretch at Nakayama, she covered the final two furlongs with lap times of 11.0-11.5. A solid runner, Red Anemos has displayed good racing sense and will likely find the Hanshin course to her liking. Her trainer Yasuo Tomomichi leads all trainers with 14 wins of this year’s 2-year-old races, which kicked off from early June. Keita Tosaki, who tops Japanese jockeys in wins this year (and chases Christophe Lemaire and Mirco Demuro), is expected to have the ride. Others worth a mention are the Daiwa Major-sired Meisho Shobu, who won her debut over the Hanshin mile in late September and has made the money in all three starts thereafter. Last out, she ran second in the Daily Hai Nisai Stakes, a Grade 2 mile at Kyoto on Nov. 10. Tanino Missionis one of those vying for the remaining three spots in the lineup. If she slips in, she will be following in the footsteps of her famous dam, Vodka, who in 2006 made the cut after only one start, won the race and went on to capture seven Grade 1 races, including the Tokyo Yushun (Japanese Derby).